Learn how a revolutionary digital system design tool, System Surveyor, is enabling customer engagement from the first site visit. In our online, click of a button world, customer expectations are evolving rapidly. 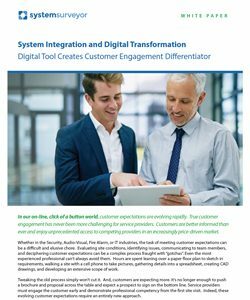 True customer engagement has never been more challenging for service providers. Customers are better informed than ever and enjoy unprecedented access to competing providers in an increasingly price-driven market. Whether in the Security, Audio-Visual, Fire Alarm, or IT industries, the task of meeting customer expectations can be a difficult and elusive chore. Evaluating site conditions, identifying issues, communicating to team members, and deciphering customer expectations can be a complex process fraught with “gotchas”. Even the most experienced professional can’t always avoid them. Hours are spent leaning over a paper floor plan to sketch in requirements, walking a site with a cell phone to take pictures, gathering details into a spreadsheet, creating CAD drawings, and developing an extensive scope of work. Tweaking the old process simply won’t cut it. And, customers are expecting more. It’s no longer enough to push a brochure and proposal across the table and expect a prospect to sign on the bottom line. Service providers must engage the customer early and demonstrate professional competency from the first site visit. Indeed, these evolving customer expectations require an entirely new approach. In this whitepaper, you’ll learn how a revolutionary digital system design tool, System Surveyor, can simplify system management and reduce design time by 50%.